This is the third and last post of a small series where I’ve been sharing my thoughts on Hobonichi and its Tomoe River paper. You can read the first post (on rubber stamping in Hobonichi) here, and the second post (on washi tapes) here. I’m on my second Hobonichi Techo, which means I’ve been writing on its Tomoe River paper for quite some time now. It doesn’t mean I’ve been writing in my Hobonichi daily; there are days, even weeks, where the pages are blank. But I think I spent enough time with it so far to be able to finally talk about some of the pens I’ve tried, and highlight what worked and what didn’t work for me. 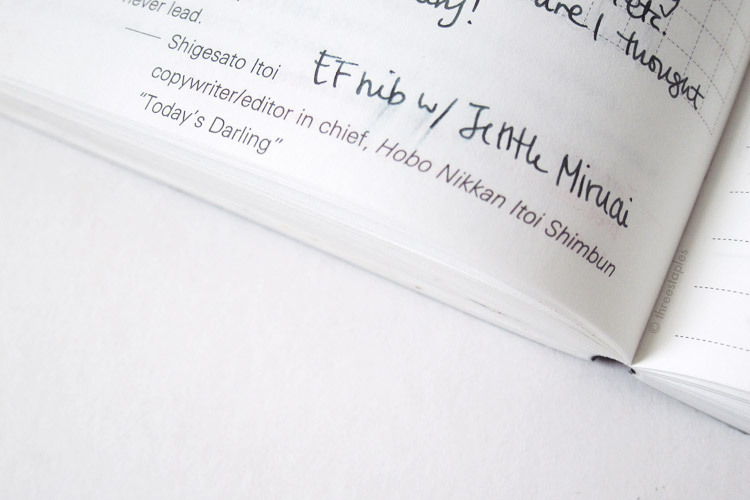 Note: In this post I use “TR” as an abbreviation for Hobonichi’s Tomoe River paper. Testing various gel pens in the back pages of Hobonichi. This wasn't a scientific comparison by any means. It's simply to show what could happen if you don't wait for the inks to dry. One of the first things I learned from using TR paper is that I have to be very patient. Let the ink dry completely. Even when you think you’ve given it enough time to dry, it’s safer not to touch it. Because a little swipe with a fingertip (worse yet, a moist fingertip) can smudge the ink. Obviously, this depends on the ink formula, but surely I can put some of the blame on the TR paper’s characteristics. I mean, it’s so thin, yet the ink doesn’t bleed through! Where does the ink go if it’s not absorbed by the paper? Oh, it’s on the surface, taking forever to dry. I’m sure seasoned Hobonichi users are saying “well, duh” by now, and it’s not like I haven’t heard that TR paper requires extra drying time. But some things are better learned through experience, I guess. I knew not to expect much from fountain pen inks, as most of them are dye-based and not waterproof. But I was disappointed to find that gel pens, too, require extra time and can be more sensitive to moisture, even the ones that never have these problems on regular paper. Some gel pens are better or worse than others. The Pentel Hybrid Technica, for example, smudges even after letting it dry for a long time. Thankfully, my favorite gel pen of all time, Pentel EnerGel Euro Needle-Point in 0.35 mm, is one of the better ones. Another thing I learned is that I don’t enjoy the feel of gel pen tips when writing in my Hobonichi. I generally use finer tips (0.35–0.4mm), and these feel too pointy on the delicate TR paper. I tried using the plastic Hobonichi pencil board to add stiffness, but it made the writing surface feel too slick. This was really unfortunate for me, as gel pens are my primary choice in pens, and I really wanted to use them with Hobonichi. This is why, for awhile, I was unsure I would continue using Hobonichi in the new year. Oh, one happy discovery I made is that Pilot Futayaku Double-Sided Brush Pen in black/gray ink is fantastic on the TR paper. The ink still requires a lot of caution and patience, but it doesn’t bleed through. Once it’s dried, it stays put. I especially like the gray tip; since the ink isn’t absorbed right away, you can push it around on the paper for a nice watercolor effect. I’m still using drawing pens with Hobonichi; I just limit them to drawing, not writing. I make line drawings with a graphic liner (like Shaun the Sheep above!) and once they’re dry, I often shade them with the Pilot Futayaku gray ink. I’ve heard plenty of people raving about how wonderful fountain pens are on Tomoe River paper, so that’s what I tried next for writing, despite knowing they’re not waterproof and that I’d have to be extra patient. I’m glad I didn’t give up because FPs are what I mainly use these days with Hobonichi. At first, I wasn’t exactly sure how to use my Hobonichi, but now that I’ve found a great fountain pen+nib+ink combo that works well on the TR paper, I’m journaling a lot more regularly. My favorites are the Pilot Kakuno (F nib) with J. Herbin Cacao du Brésil ink. I’m not an FP expert, so I can’t say this is the best combo ever, but out of all the pens and inks I already own, it suits my needs the best. I really enjoy how the TR paper feels at the tip of my nib (without the pencil board), and I find Cacao du Brésil to be more resistant to smudging than other inks I have at home (e.g. Sailor Jentle Miruai). These properties alone could have convinced me to not give up on Hobonichi, but I absolutely love the color, too! It’s a warm gray with a hint of purple. Since my handwriting is small, I normally prefer Japanese EF nibs (especially on a small grid like in the Hobonichi) but the EF I tried (from Pilot Penmanship) felt too scratchy. To balance out the wider F nib, the soft gray color of Cacao du Brésil keeps my pages from looking too dark or contrast-y. I’m tempted to try more gray inks but the small bottle I got looks like it’ll last me a long time. Good, because I want to feel “settled in” with my Hobonichi already! So yeah! Thanks for reading this far! Hobonichi has been a great excuse for me to experiment with different pens and finally see for myself how TR performs. It’s tested my patience at times but I had fun most of the time and I learned a lot. I’m still enjoying it and I’m sure I’ll discover new favorite fountain pen inks as I go. 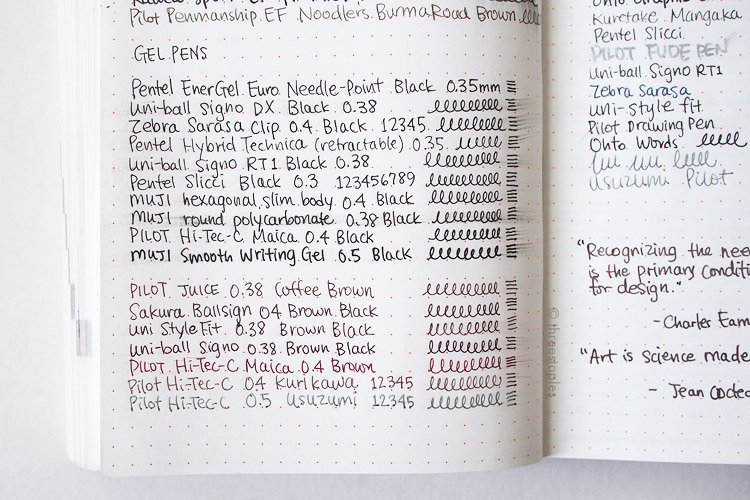 What are some of your favorites pens to use with Hobonichi? A Practice: My Hobonichi Techo | From the Pen Cup: I find Mary’s “three good things” per day idea inspiring, as is Ian’s Journaling with Purpose | Pens! Paper! Pencils! What I Use: Hobonichi Techo Journal | Fountain Pen Quest: take good note of Ray’s blotting paper idea! PS: Amazon links in this post are affiliate links, which means, if you follow these links and make a purchase, I'll earn a tiny commission. Every little bit will help support the hosting of this site, and I’d very much appreciate it if you decide to follow these links. This is the second of a small series of posts where I'll share what I've learned about Hobonichi and its Tomoe River paper. You can read the first post here, on rubber stamping. Sometimes I like to decorate my Hobonichi with washi tapes. Not only are they visually interesting, they can be used as space dividers when I want different sections on the page. They also help me overcome the fear of writing on an empty page. And sometimes it's a quick way to illustrate what I'm writing, if the tape's design matches the topic. So all around, good tools to have for a little fun in journaling. It was a rainy day, a perfect excuse to bust this tape out. Sometimes, I decorate Hobonichi pages like this even before writing. It actually motivates me to write! Some of my mizutama tapes in action. No, I don't think I was writing about undies. It just cracks me up. But, what I’ve discovered is that washi tapes adhere to the Tomoe River paper much more strongly than they do to “regular” papers. I learned it the hard way when I tried to peel a piece of washi tape off and ended up damaging the paper (washi tapes are known to be re-positionable). You'd think that the TR's smooth surface would make it easier to peel... but nope. I'm sure it depends on each tape's adhesive but now I try position the tape perfectly the first time around. If I mess up, I try to leave it alone. Plus, the Tomoe River paper is so thin that even when the tape is peeled off successfully, it ends up warping or stretching the paper. So, better be safe than sorry! Grid definitely helps when aligning colored tapes like this. Another thing I learned: it’s better to cut tapes with a pair of scissors, so that the resulting edge is very clean. I know that one of the benefits of washi tapes is that they can be cut easily with your fingers. But that leads to an irregular, sometimes sticky edge that can stick to the opposing page in Hobonichi. That's a bit annoying, and potentially damaging. I cut these tapes with the cutter they were packaged with and now they stick to the opposite page. This isn't something inherent about the Tomoe River paper or washi tapes but more of a preference I developed after using Hobonichi for the past year or so. I learned that I like washi tape designs that have “clear backgrounds” because they're more versatile and forgiving in page layouts. I’m talking about tapes that are semi-transparent white or off-white with designs that are not edge-to-edge. They don’t have harsh edges that require me to be more careful in aligning (although the grid in Hobonichi helps), which leads to less reasons to re-position the tape. I can cut them into little pieces and have them "float" in middle of the page. And they can look integrated with my writing and drawings more easily than the tapes with colored backgrounds. I still buy tapes that have colored backgrounds (and they have their own uses) but not as much. I certainly never thought I would use the tapes with clear backgrounds this much! Tapes with colored backgrounds (left stack) vs. tapes with “clear” backgrounds (right stack). Some tapes, I cut around the design, instead of a simple rectangle, so I have more writing space around it. Overlapping tapes can be a whole different game, with fun results. Another reason why I prefer “clear” tapes. I really like tapes with black & white or gray designs, too, because they allow me to mix and match easily for a more harmonious look. Before Hobonichi, I would have never thought I would prefer plain B&W tapes but now I do! Thinner tapes like these can act as really good space dividers on journal pages. The tape cutter is a fantastic one from Muji; I loaded it with two separate rolls. 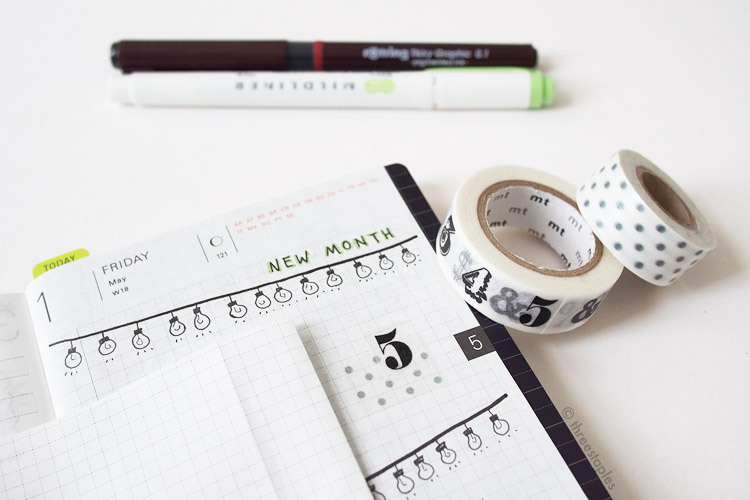 Are you a fan of washi tapes like I am? Do you find the Tomoe River paper in Hobonichi to be stickier, too, or am I alone in this? Check out Natsume on Instagram, at natsume_notebook. 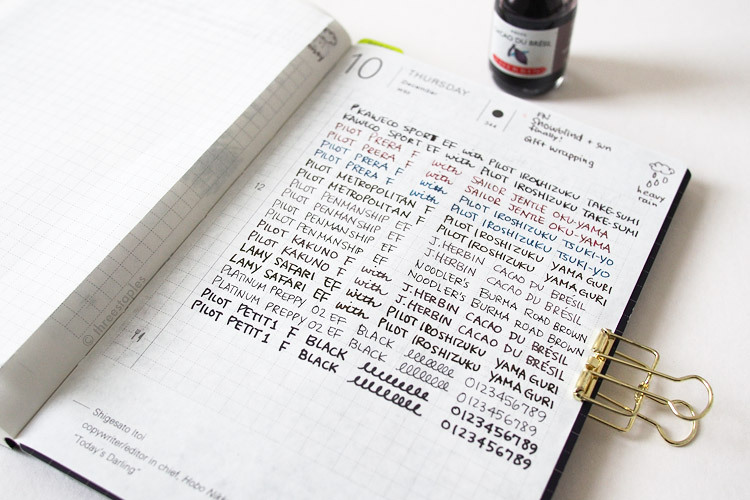 She is a master at Hobonichi page layouts using a limited color palette. 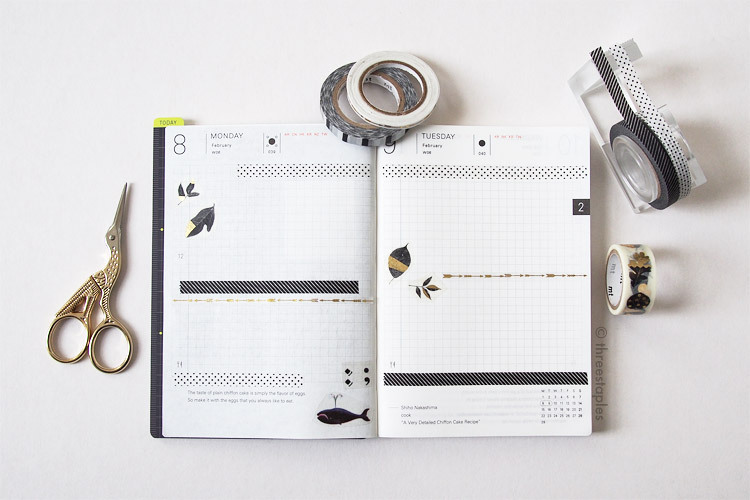 See how the talented April at Penguins Creative mixes washi tapes and drawings in her Hobonichi, at her Instagram penguinscreative. Other inspiring Hobonichi users at Instagram: __freenote and linenworks.